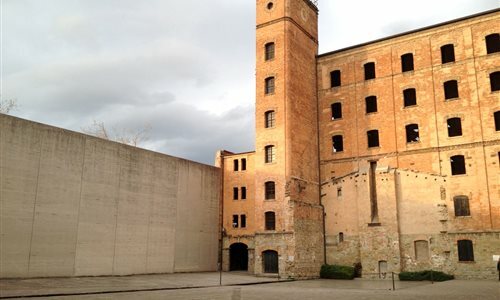 The San Sabba Rice Mill, founded as a factory for processing rice at the end of the 19th century, was the only concentration camp in Italy equipped with a crematorium. Described by the Nazis as a Polizeihaftlager (police detention camp), it carried out three functions: eliminating hostages, partisans, Italian, Slovene and Croat political prisoners, and a small number of Jews; sorting political and racial detainees for deportation to other camps in the Reich (usually Dachau, Buchenwald and Mauthausen for politicians, Auschwitz and Bergen Belsen for the Jews); and storing property confiscated from Jewish communities of the Adriatic Coast. It is very difficult to assess the extent of each of the three functions. We can only say that many thousands of prisoners were sent to other concentration camps, and thousands of partisans and political prisoners were murdered. In 1965 the Rice Mill was designated a National Monument. In later years the site was developed to a design by the Trieste architect Romano Boico, and opened in its present form in 1975. Today you can visit the "Hall of Crosses" where those arrested for racial and political reasons waited to be deported to other concentration camps of the Reich, and the "micro-cells" in which Italian, Slovene and Croat partisans were held, many of them destined for elimination. In addition, the Museum's "Memorial Hall" houses a statue by the Trieste sculptor Marcello Mascherini, dedicated to the martyrs of Auschwitz.